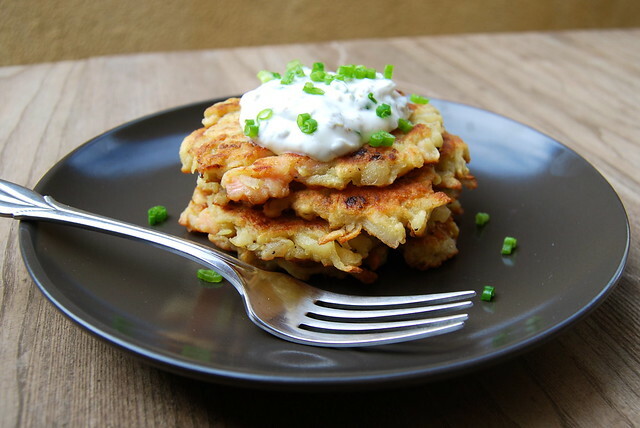 A Latke is a traditional Jewish potato pancake, which while in England is more the type of thing you’d find in a Kosher deli or restaurant, is almost as common place on brunch menus here in America as a Hash Brown, which I would call the closest English equivalent to the Latke. 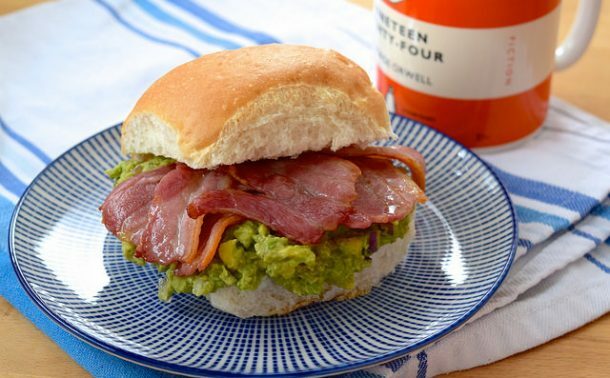 On New Years morning I’d serve a plateful of these with either mimosas (Bucks Fizz if we’re still translating this into British traditions) or Bloody Marys (I love Emily Schuman’s Bloody Mary bar if you’re catering for a crowd), virgin or not. The recipe below serves two (eight griddle cakes), so multiply the values by every two people you’re cooking for, and keep your oven on a low heat (use the warming oven if you’re cooking on an Aga) to keep the Latkes warm while you cook. 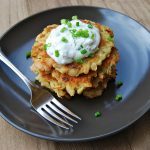 This luxury twist on a classic potato latke is perfect for New Years Day brunch. First make the soured cream and store it in the fridge until you’re ready to serve. 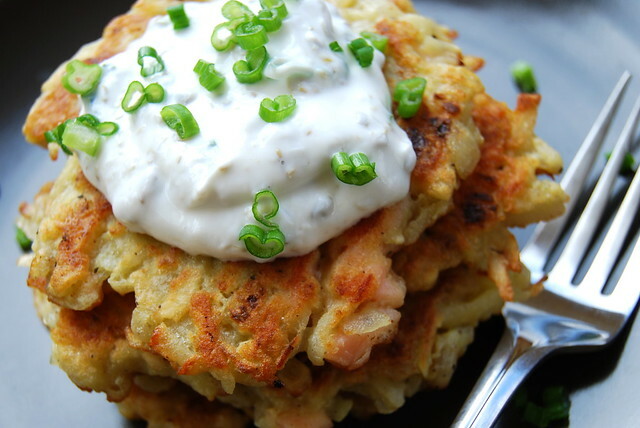 If there are just a couple of you, you can serve it with the Latkes, sprinkling a little extra dill or chives on top of each stack. In these photos, I have actually used finely chopped green tops of spring onions. There are so many ingredients missing from the supermarket at the moment, you can tell that it is around Christmas time! Chop the capers as small as you can get them and add to the cream. Do the same with about a tablespoon full of chopped dill or chives (which one you use is up to personal taste. Dill will give a more complex flavour and bring out the taste of the salmon more, the chives will be more oniony and pungent. Also, it is up to what is left in the supermarket by the time you get there!) Stir well, and squeeze in lemon juice to taste. For the Latkes, finely chop the onions and garlic. Heat a little bit of oil in a large saucepan over a medium heat and gently fry the onions and the garlic until the onions have softened and are very slightly golden. Remove from the pan and set aside. 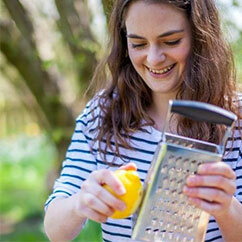 Peel the potato and grate on the largest blade section of your grater. 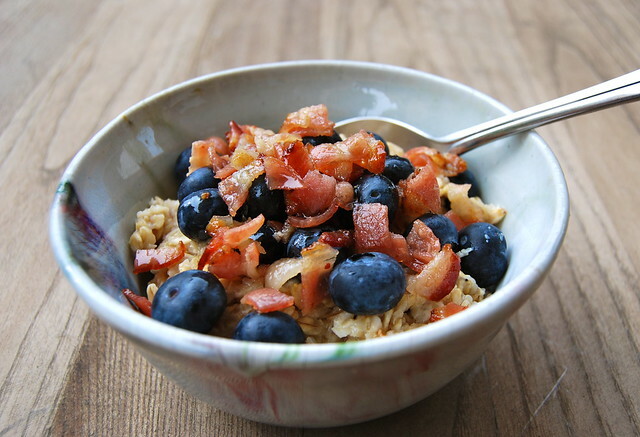 Set aside in a bowl and sprinkle with sea salt. This will help draw the excess moisture of of the potato. If you don’t know why this is, you clearly were not paying attention during science lessons at school, and if I can retain that much from a science class, anyone can. 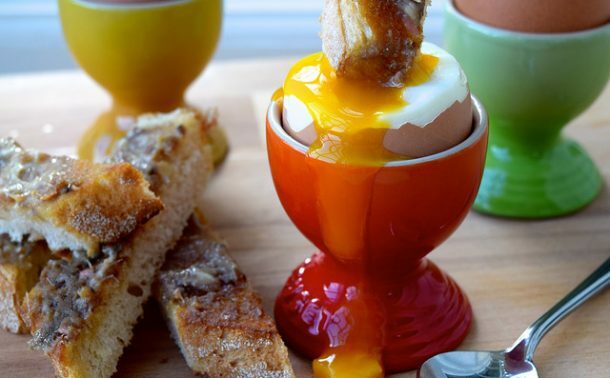 In a large bowl beat the eggs, then whisk in the flour, the baking powder and a pinch of salt. Stir in the onion and garlic mixture. Squeeze the excess liquid out of the grated potato in small handfuls over the sink, and add to the mixture. Slice the smoked salmon into small strips, about twice the size of the potato gratings, and stir into the mixture too. Heat about a tablespoon of oil in the saucepan over a medium to low heat. 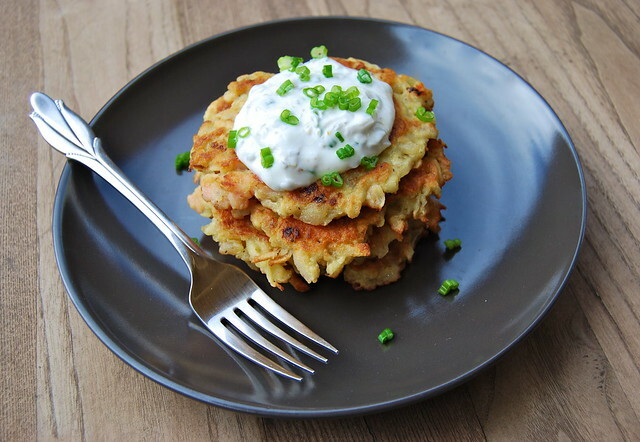 Spoon about a heaped tablespoon full of Latke mixture into the pan, flattening slightly into a fritter with the back of the spoon. Gently fry for a minute or two until the edges of the Latke become slightly golden brown. Flip, and brown the other side until the colouring is even on both sides. Remove from the pan and keep warm until you are ready to serve.